following the loss of their grandmother. "After working in the funeral business for over 25 years, I thought I understood what it took to organise a funeral,” said Ash, “But when I lost my grandmother, the reality hit me. I realised that I hadn’t fully appreciated the emotional task of letting everyone know of our loss, and communicating our funeral day details became a huge challenge. My wife and I believed that there must be an easier way, and that’s where the idea for afuneralnotice came from. It’s a way to make sure that everyone our loved one knew can be informed about their passing and have the chance to pay their respects, including people that the family may not have been in direct contact with." Bring families and friends together, with one simple message. afuneralnotice.com provides a new way to share funeral day details. 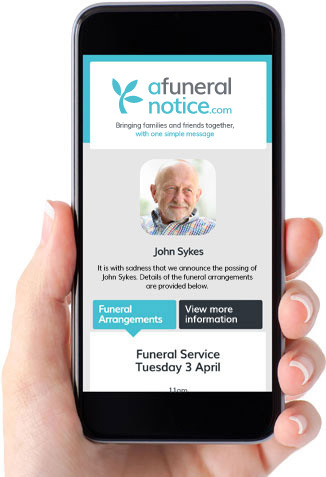 For just £19.99, you can use our simple system to create a personalised, mobile Funeral Notice. Then, at the push of a button, you can send it by SMS text message, giving family members and friends all the information they need, direct to their mobile phone.